I have some good news for MobileMe users. In case you were unfamiliar with it, MobileMe is a collection of a subscription-based online tools and software offered by Apple. The collections includes an emailing service named simple “Mail.” Apple is now offering the latest beta for MobileMe Mail. Apple is asking its users to give the new beta a try so that sufficient ‘field testing ‘can be performed. Existing MobileMe users can sign up here with their MobileMe Mail account and request an invitation to start using beta. 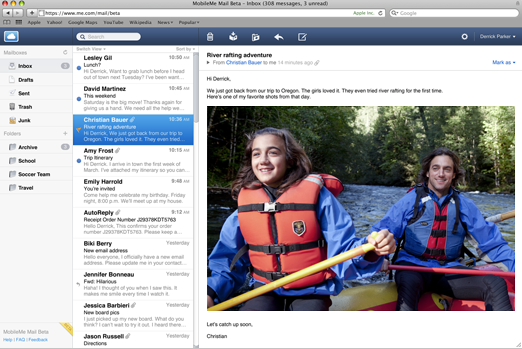 Widescreen and compact views: the new widescreen view lets you see more of each message with less scrolling. Choose compact view to hide your folders or classic view to see more of your message list. Needless to say, this is something that will facilitate usage of Mail on iPad. Rules to keep your email organized everywhere: Like other email services, Mail now will have rules with which we can automatically fill incoming messages into folders. These rules will also exist if we are using an Apple device to check our MobileMe Mail. Single-click archiving: click the Archive button and the selected message is quickly filed into the Archive folder where it is always available for future reference. Formatting toolbar: we can create great looking email messages using formatting buttons to bold or italicize text, change font color, insert images, insert shortened URLs, and more. Improved performance: Mail at me.com loads your inbox and messages faster. Increased security with SSL: users receive SSL protection when using their MobileMe Mail account on their PC or Apple device. Currently the supported web browsers of the service include Safari 4, Firefox 3.6, and Internet Explorer 8.